The Instant Pot and other electric pressure cookers provide a perfect way to cook gluten-free meals with a maximum of speed, convenience, nutrition, and flavor. For the millions of people who, by doctor's orders or by choice, must exclude or limit gluten in their diets, finding Instant Pot recipes has been a huge challenge. This timely book, now in an expanded edition with 50 new recipes and color photographs, solves the problem. Its recipes focus on dishes that are the most problematic for gluten-sensitive cooks, such as main-course dinners that typically have a grain component, as well as breakfasts and desserts, which also usually have wheat or gluten. In their place, The Gluten-Free Instant Pot Cookbook offers up tasty and creative gluten-free alternatives that cook up fast and delectably in the pressure cooker. Everyone in the household will love these dishes, even those who are not eating gluten-free. From hearty breakfast dishes like Creamy Poblano Frittata or Caribbean Breakfast Burritos, through substantial and warming soups like a Creamy and Spicy Butternut Squash Soup or a Pumpkin Black Bean Chili, and crowd-pleasing dinner dishes like Mom's Old-Fashioned Pot Roast, Gluten-Free Lasagna with Meat Sauce, and Pork Tenderloin Marsala with Wheat-Free Pasta, these are spectacular recipes that cook up lightning-fast in the electric pressure cooker. The Instant Pot and its cousins are also surprisingly powerful tools for making desserts, and the offerings here—all completely gluten-free—including Apple Cinnamon Bread Pudding, New York Style Cheesecake, Double Chocolate Fudge Cheesecake, and a scrumptious Mexican Chocolate Pound Cake. 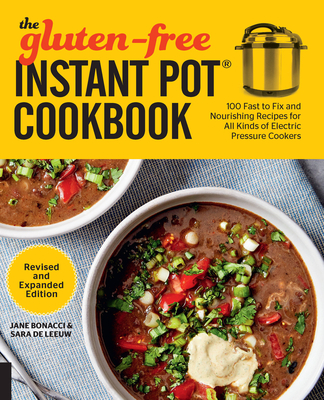 Add the power and convenience of the Instant Pot and its cousins to your gluten-free diet with The Gluten-Free Instant Pot Cookbook. Jane Bonacci is a food writer, professional recipe developer, and editor. She is the creator, writer, and photographer of the blog The Heritage Cook, where she shares favorite recipes—many of which are gluten-free—and kitchen wisdom. Her blog has been a finalist in the International Association of Culinary Professionals Awards for Best Recipe Blog. After a successful career in high tech, she changed directions to pursue her lifelong passion for cooking and baking, working at a number of cooking schools where she cooked with and learned from many of the country's finest chefs. She lives in the San Francisco Bay area. Sara De Leeuw is the cook, writer, and photographer behind the popular blog My Imperfect Kitchen. When Sara is not blogging, she serves as the charming co-host of the podcast, Food Blog Radio. Alongside her co-host, Gary House, Sara conducts interviews with food bloggers from all around the world. She also writes the column "Sara’s Kitchen Adventures: Recipes with a Local Flair” for IEShineOn.com. A Master Food Preserver as well as a certified BBQ judge for the Kansas City BBQ Society, she lives in Ontario, California.